The truth is, it’s a bit of a guessing game—even when you ask people their intentions. Nevertheless, as we enter the holiday shopping season, trying to figure out what devices consumers plan to purchase next becomes a bit of a sport. There are historical trends to study, Black Friday and Cyber Monday ads to pore over, and gut instincts to trust, but ultimately, no one ever really knows for sure what consumer technology products will be winners and what will be losers in a given timeframe. Despite the uncertainty, people continue to investigate the topic because it’s kind of fun (in a sick, sort of way, I suppose), and because it is critically important to the future of many companies and many individuals. In my case, my firm, TECHnalysis Research, recently completely a thorough device usage study of over 3,000 consumers across the US, UK, Germany, Brazil and China. 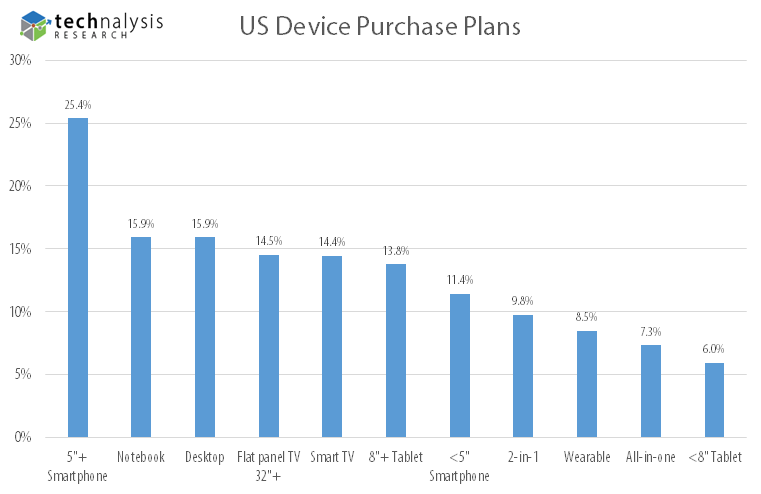 The focus of the online study was to get more insight into how people are really using their core devices (PCs, tablets, smartphones, TVs and wearables), but we also asked what devices individuals planned to purchase over the next year. Note that this doesn’t necessarily translate into what they plan to purchase this holiday season (and most of the responses were actually collected in late September/early October, before most people have planned out their holiday shopping), but it does give a good overall sense of device priorities. A summary of results for the entire 3,012 person sample are shown below, followed by the US-only results (1,024 consumers). Not surprisingly, smartphones with 5” and larger screens continue to top the list, as many consumers around the world (and even in the US) have yet to make the transition to these incredibly useful devices. What’s interesting, however, is that several PC form factors did well on both a worldwide and US basis. Notebooks were number two across the total of all five countries and desktops were number four. What was surprising, however, was that in the US, notebooks and desktops actually tied for second. Despite the PC industry’s recent doldrums, the release of Windows 10 has clearly inspired more interest in the category, and that should lead to a reasonably solid 2016 for consumer PC sales. In addition, there’s a large base of much older PCs in need of upgrades, and that, combined with growing interest in PC gaming (thanks to the popularity of things like game streaming channel Twitch), is what likely contributed to the interest in desktop PCs. 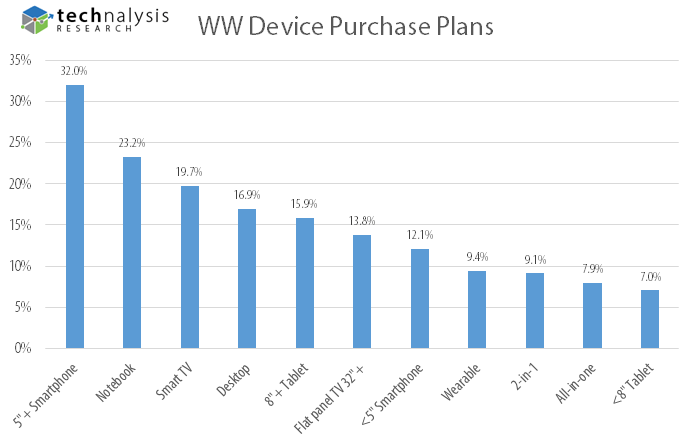 Smart TVs were the third most common category for planned purchases on a worldwide basis, but took the fifth spot, just behind non-connected 32”+ size flat panel TVs, in the US. Larger 8”+ tablets were fifth worldwide and sixth in the US. Looking briefly at the other countries, the top two choices in the UK (in order) were 5”+ smartphones and smart TVs, in Brazil it was notebooks and 5”+ smartphones, and in both China and Germany it was 5”+ smartphones and notebooks. For the sake of comparison, the same questions were asked in a similar study just over a year ago. The top three responses for the multi-country (WW) group and the top two responses in the US were the same this year as last year. The most noticeable difference was the large jump in desktop PCs, a category that nearly everyone has written off for dead. In addition, there was a modest decline in smaller smartphones, a larger decline for smaller sub-8” tablets, and a modest increase in wearables. Having conducted decades worth of buying-intention surveys, I can tell you with certainty that next year’s reality won’t match what this year’s results show (people exaggerate their buying intentions, change their minds, and adjust their priorities, etc.) Nevertheless, these types of questions do provide a sense of consumers’ mindsets, which can lead to important insights into where markets may go. So, if we see a resurgence in desktop PCs next year, remember: you heard it here first. Have a wonderful Thanksgiving. Enjoy time with family and friends and, hopefully, away from some of your devices!